In this “holiday” season, during which we in the USA celebrate our national day of Thanksgiving, and Christians around the world celebrate Christmas, one of the messages proclaimed by countless Christmas cards is, “Peace on Earth.” And what an indescribably wonderful vision that is. Think about it: no warring between nations and no hurtful conflict between individual people. No wonder people dream of and long for such conditions. 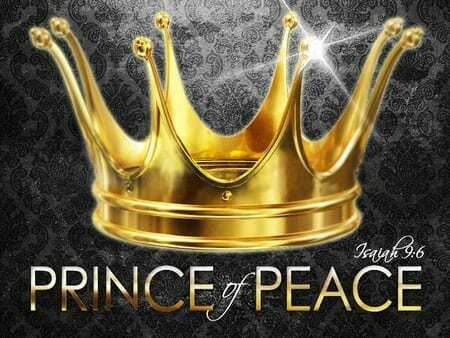 The Bible clearly says that there will be no “peace on earth” until the “Prince of Peace” (Isa. 9:6) comes back to earth and destroys all the enemies of God, which he will do. It also tells us that until then, things will get worse and worse as the majority of mankind turns their hearts away from God and His truth (e.g., 2 Tim. 3:13, 4:3 and 4). So where does that leave us now? In a perpetual war zone. Though there will not be peace on earth until the Lord Jesus comes back here, there can be peace in earth now, so to speak. How so? Because we Christians are “earthen vessels” (2 Cor. 4:7 – KJV), and we can have internal peace, no matter what is going on around us. The hallmark of Christianity, as opposed to false systems of faith, is salvation by faith, not by works. Because of the sacrifice of Jesus Christ, and our trusting in his work, you and I are justified in the sight of God. That is, our sins have been washed away, and we have a clean slate before him. God’s judgment has been passed, and we are forever “not guilty!” We stand in His grace, guaranteed of a glorious future at the appearing of His Son, our Lord Jesus. Doesn’t that just make you feel like taking a huge breath and letting it out with a giant “whew!”? How liberating! and through him [Jesus Christ] to reconcile to himself all things, whether things on earth or things in heaven, by making peace through his blood, shed on the cross. It required the very lifeblood of the Son of God to pay the price for the sin and sins of all mankind, and to reconcile us from a position of enmity with God back to a relationship of perpetual peace with Him. Because God made him genetically sinless like the First Adam, and because, unlike Adam, he chose to live a sinless life, all the way to the Cross, Jesus became the perfect and sufficient sacrifice. Now we who have made him our Lord are forever saved, sealed, and delivered in him. We are forever at peace with God. To live a fruitful Christian life, we must understand that though we have been delivered from the penalty of sin, we are not yet free from the power of sin, that sin which “dwells” within us (Rom. 7:18 – NKJV). We must do our best to live free from the presence of strife, and the only way to do that is by dispatching our internal enemy when he comes against us. The biblical principle is peace through strength. Think about it: If the neighborhood bully punches you and you proceed to pulverize him, how likely is he to hit you again? Yes, if he is just downright mean, he may well do so, but if each time he does, you reduce him to rubble, chances are that he will back off. Likewise, we must fight for our peace. Who or what are we fighting against? Satan, the thief who comes “…only to steal and kill and destroy…” (John 10:10). More specifically, we fight against the internal and external enemies bent on destroying our peace. We can’t destroy our sin nature, but we can destroy (put to death) its fruit in our lives. We often have no control over the external circumstances that beset us, but we do have control over our own thoughts about those circumstances. It is vital that we realize that truth and take up the sword of the spirit, the Word of God, to do battle in the arena of our mind. In terms of the quality of our lives, it is a matter of life and death. Here we see that it is our responsibility to “put to death” the sinful thoughts that lead to sinful behavior. Hey, that sounds like war. That’s right, because the purpose of war is to break things and kill the enemy. The following verses show us quite a bit more about the battle we are in, the weapons we must use, and what we must demolish. Like mine, your mind is an arena, in which it is the Christian (you) versus the lion. You must pay attention to the thoughts that are prowling around in the arena of your mind. If you spot a “lion,” or rather a “lyin’” (thought), you must realize that it is attacking you, and fight back with the sword of the spirit, the Word. Because of the sin that dwells within each of us, peace does not come naturally or easily to us. In fact, we must vigorously pursue it in our thoughts, our words, and our deeds. (10) For, “Whoever would love life and see good days must keep his tongue from evil and his lips from deceitful speech. (11) He must turn from evil and do good; he must seek peace and pursue it. Those verses exactly convey the truth of Luke 2:14: peace is only for those who humbly turn their hearts to God and receive what He gives. And God makes it clear to us how willing He is to help us have His peace. The following two verses show that just as Jesus promised peace to his disciples, so he is with us today via his spirit, and walks with us through the trials and tribulations of life to give us the same peace. Peace I leave with you; my peace I give you. I do not give to you as the world gives [a counterfeit peace based upon circumstances]. Do not let your hearts be troubled and do not be afraid. Our everlasting peace with God is the basis of our living with peace in our hearts now. God tells us how to have and manifest His peace, the peace of God, also called the peace of Christ. It is important to note that the choice is yours, and that when you do your part, God most certainly will do His. (6) Do not be anxious about anything, but in everything, by prayer and petition, with thanksgiving, present your requests to God. (7) And the peace of God, which transcends all understanding, will guard [as with a military guard] your hearts and your minds in Christ Jesus. (8) Finally, brothers, whatever is true, whatever is noble, whatever is right, whatever is pure, whatever is lovely, whatever is admirable—if anything is excellent or praiseworthy—think about such things. (9) Whatever you have learned or received or heard from me, or seen in me—put it into practice. And the God of peace will be with you. There is no situation in your life too big or too small for your heavenly Father, and your Lord, to care about and want to get involved in. They have your back. Your part in the reciprocal relationship with them is clear: do not freak out, come to them with your requests, think about godly things, practice the same. Of course, God would never ask you to do something you can’t. And all He asks is that you do what you can (Mark 14:8a). When you do, the peace of God guards your heart, and the God of peace is with you. It doesn’t get any better than that. (15) Let the peace of Christ rule in your hearts, since as members of one body you were called to peace. And be thankful. (16) Let the word of Christ dwell in you richly as you teach and admonish one another with all wisdom, and as you sing psalms, hymns and spiritual songs with gratitude in your hearts to God. (17) And whatever you do, whether in word or deed, do it all in the name of the Lord Jesus, giving thanks to God the Father through him. In verse 15, the Greek word translated “rule” means “to be an umpire.” What is an umpire? He is one who watches very closely to see if there is the slightest infraction of the rules, and when he sees one, he lets you know about it in no uncertain terms by loudly blowing his whistle! As we put “the word of Christ” in our hearts, it acts as an alarm system to warn us when we are having a thought that is not in keeping with “the rules.” Anxious, agitated, un-peaceful thoughts are “whistled dead,” so to speak. One big key to staying peaceful is to stay thankful. Thanksgiving focuses our hearts upon the Source of that for which we are thankful, and Isaiah 26:3 says that God will keep in perfect peace him whose mind is steadfast, because he trusts in Him. Amen. The greater our individual peace, the more likely we will be to act in such a way so as to bring corporate peace in the Body of Christ. The more we pursue peace in our own heart, the more we will relate to others in a peaceful way, and, as per Ephesians 4:3, that is critical to the effective working of the Body. (3) Make every effort to keep the unity of the Spirit through the bond of peace. You will note that I included verses 4-6, and that is because they set forth “the magnificent seven,” that is, the seven primary doctrinal truths that Christians must properly understand from the Word and agree upon if we are to “…keep the unity of the Spirit through the bond of peace.” It is being likeminded on those basic truths that gives us the greatest possibility for true unity. I encourage you to consider how well you can articulate each of them, first for yourself and second for others. And finally, if we hold on to the peace of God, we can give it away to others, both by our words and our deeds. Remember that Jesus is the reason for the season, and that HE is our peace (Eph. 2:14). As you live for him, each day can be a holy day, or, if you prefer, a “holiday.” All you need to do is start each morning with that giant “Whew!” signifying your awareness of the truth that no matter what happens, you and God are at peace, He loves you fervently, and you are guaranteed to live forever in Paradise with Him, the Lord, and lots of nice folks. Everything will be better than OK. So enjoy this holiday season. Give thanks, and walk in peace, reaching out in love to those in your world. Spread the peace to those on earth.